This photo was taken just days before the attacks on the World Trade Center. A group of friends named and registered a star in the heavens in memory of Marc Zeplin. How fitting as he was a star in the eyes of so many. Successful as an equity trader, he formed close relationships with his clients but he was foremost a family man. 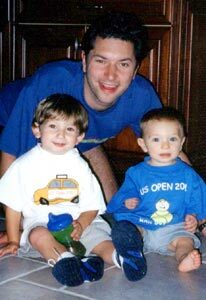 Marc was very caring and devoted to his wife Debra, sons Ryan (left, then 3 yrs old) and Ethan (then 10 months), parents, sister and in-laws. He adored his children and treasured the time he spent with them. Marc was very proud of the new home he and his wife built in Westchester and enjoyed the change from urban to suburban living. Raised in Long Island, Marc attended Oceanside High School and the University of Michigan where he also continued to earn a master's degree in the acclaimed business school. Marc's first career calling was sports casting. He loved sports of all kinds and enjoyed broadcasting games in Michigan during his college years. However, when he returned to New York, he found immediate employment in the financial world and soon after started at Cantor Fitzgerald where he became a partner. Marc was truly a "master of the word." He knew how and what to say in order to put you at ease, make you laugh or help you resolve a problem. Marc loved people. He had many friends and demonstrated a zest for living life to the fullest. He was tops in every way. He even worked at the top. The right position for so many years unfortunately was wrong on only one day - September 11, 2001.